Over your cat's lifetime, there may be times when you notice that your cat may be missing fur, or it may be falling out or disappearing in clumps. There are several reasons for feline baldness and hair loss, and getting to the bottom of them can help your cat lead a healthier, more comfortable life. While the appearance of your cat's hair loss may vary from animal to animal, there are several general causes that typically are behind the problem. Check with your vet to make sure that there is no other, underlying illness and give your cat extra attention as she adapts to any change. If the stress-induced balding continues, ask your vet about antianxiety medications. As your cat ages, he may begin losing fur over large areas of his body. The skin beneath the fur may appear dry and any fur growing back may be a different color. This can frequently be attributed to a nutritional deficit. Some cats, particularly as they age, need more nutrients added to their food. Look for cat foods made with few fillers and more whole ingredients. Consider adding nutritional supplements such as powdered or liquid vitamins to his food each day to help reverse the problem. 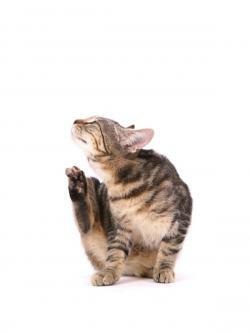 If either of these signs are present, take your cat to the vet to make sure fleas, pesky ear mites, or ringworm aren't behind the cause of your cat's missing fur. If they are, your vet can prescribe a treatment plan. If your cat is missing only occasional patches of hair in various places on her body, and these are sometimes accompanied by scratches or bloody areas, take a look at how your cat interacts with other animals. If you have other animals in the house, or your cat is allowed outdoors, try to observe how your cat plays with her companions. It may be that rough play is behind the missing fur. If this is the case, try separating the animals when not supervised, or consider keeping your cat indoors. 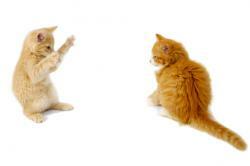 Sometimes fur loss in cats can be attributed to an underlying illness. 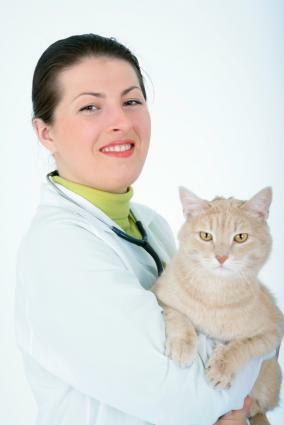 Thyroid problems can sometimes result in fur loss in cats, as can allergic reactions. If you have been unable to find the cause of your cat's fur loss and have tried changing his diet, a trip to the vet for a thorough examination may turn up an underlying problem that is behind the missing fur. To help keep your cat's fur healthy, whether it some is missing or not, be sure to brush and groom your cat on a regular basis. Regular brushing helps to stimulate new hair growth and is crucial to the overall health and well being of your cat. The added time spent examining your cat's fur on a regular basis may also help you catch problems before they get out of hand.